On 29th October , 2017, in order to show appreciation to people who have great contribution to the global security industry, the globally largest professional security exhibition – the 16th CSPE Organization Committee and the Global Security Industry Alliance had organized the “5th GSIA Gold Shield Award Contest and Award” Ceremony which has been held in Sheraton Shenzhen Futian Hotel. Famous Guests attending the Ceremony include approximately 1,500 renowned security experts, and security organizations and association representatives from 33 countries and regions around the world. The Chairperson of the 16th CPSE Organizing Committee Yang JinCai, the Secretary of GNSS & LBS Association of China Zhang ChuanDe, the Chief Expert of Police Force Equipment Tao JinSheng, the Vice CEO of Seagate Technology Xuan Dan, more than 100 representatives of local and foreign governmental departments, the Ministry of Public Safety, the Ministry of Science and Technology, banking industry, communication industry around the world, and more than 500 security experts. The Chairperson of the 16th CPSE Organizing Committee Yang JinCai had given speech to local and foreign guests. The “5th Global Security Contribution Award” Contest and Award Ceremony with month’s information research, selection, and organization of domestic and foreign insiders of security industry, through deliberations regarding technical innovations, environmental protection, social responsibility, enterprise influence, brand recognition, personal charisma, product market share, and contribution to the development of the global security industry etc. 8 aspects. 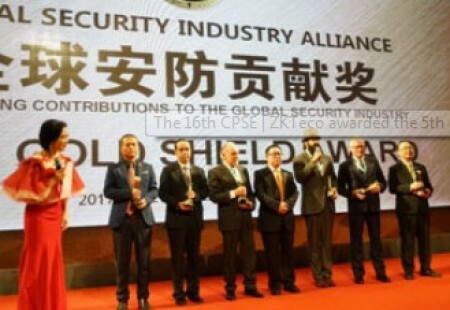 John Che, the CEO of ZKTeco, has obtained the honor to be awarded the 5th GSIA Gold Shield Award along with other 11 winners from 6 countries. “I am very grateful to receive recognition and support from the CPSE Organizing Committee, this honor is a recognition to all ZKers’ effort, and we shall continue to bring “Made in China” and “Created in China” to the whole world!” said John Che. The honor ZKTeco received is won by the mutual devotion and effort by more than 3,000 ZKers around the world, and by the strengths of ZKTeco’s 40 global science research units. With the invitation from CPSE Organizing Committee, John Che and more than 20 CEOs, CTOs and CMOs of ZKTeco branches were on stage to meet the guests and receive appreciation. With the rapid development and innovation of technology, ZKTeco has always been at the frontline of biometric verification core technology, constructing business ecosystems with platform thinking, leading the banking development with IoT+ Internet ideas, continuously striving for innovations with all ZKers with “Responsibility, Integrity, Pragmatism and Excellence” and striving to be the paragon of the industry.